The name Gannen is derived from the Japanese calendar scheme. In Japan, years are given by the name of the era and a number. For example, 'Hensei 20' stands for 2008. At the start of a new era (nowadays only upon imperial succession) the counting starts over again. Gannen is used to indicate the first year of a new era, e.g. Heisei Gannen - 1989. Literally, the term Gannen thus means 'first year', but it also represents the start of a new era. From our point of view, Gannen stands for a new era in 3D metrology. Our Gannen probes enable you to perform measurement tasks you could not do before. As product features are getting smaller and demands for uncertainty increase, we invite you to take the next step in 3D metrology and enter this era. Gannen probes have nanometer repeatability in any direction and at any position in its measurement range. The measurement uncertainty of the Gannen probes is unrivalled. 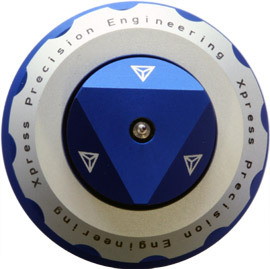 The Gannen XP, the flagship probe of Xpress, features a volumetric uncertainty of 50 nm, making it the most accurate probe in the World today. Gannen probes are available with micrometer sized probe tips. The probe are supplied with ruby tips down to 120 micrometer in diameter and custom tips down to 50 micrometer in diameter. Both the Gannen XP as the Gannen XM probes are designed for extremely low probing forces. The colliding mass is below 50 mg, whereas standard probes have a colliding mass of several grams! Also, the stiffness can be as low as 50 N/m (Gannen XM), meaning that you can do measurements faster without damaging the work piece, even when using these small tips. The sensor is suitable for true scanning and one point probing measurements. Also, touch-trigger operation is possible upon request. Gannen probes comes with a custom designed holder tailored towards the specific needs of the Coordinate Measuring Machine (CMM) used. This means optimal measurement uncertainty, replaceability and repeatability.